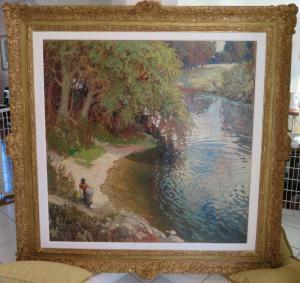 Oil on canvas figural landscape by Latvian-born German painter Johann Valters-Walter Kurau (1869-1932). 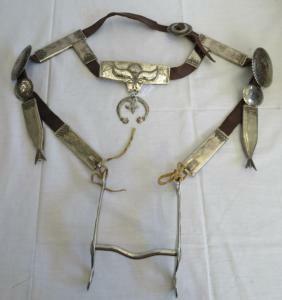 Horse headstall made in New Mexico around 1940 from leather, steel and sterling silver. Pre-Columbian bird figure with a parrot-like face, large eyes and a three-stepped feathered crest. 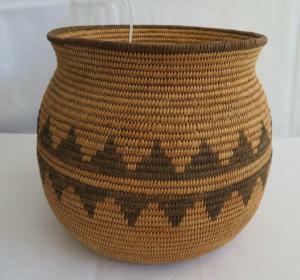 Circa 1930s Chemehuevi basket, produced in the Mojave Desert from willow and devil's claw. 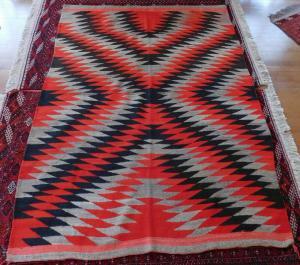 Transitional Navajo weaving made of wool and dye in New Mexico in the 1890s. 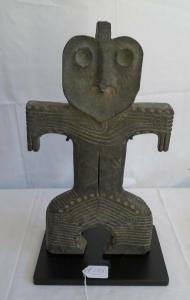 Helms Auction, Inc.’s Tribal & Native American Summer Shindig planned for this coming Saturday, July 7th, is packed with over 460 lots of rare collectibles. EL CAJON, CALIF., UNITED STATES, July 2, 2018 /EINPresswire.com/ -- EL CAJON, Calif. – Helms Auction, Inc.’s Tribal & Native American Summer Shindig planned for this coming Saturday, July 7th, is packed with over 460 lots of Navajo weavings and Pueblo pottery; pre-Columbian artifacts; prehistoric arrowheads and other stone tools; Oceanic, African and Chinese tribal artifacts; 20th century Native American and Mexican jewelry items and more.